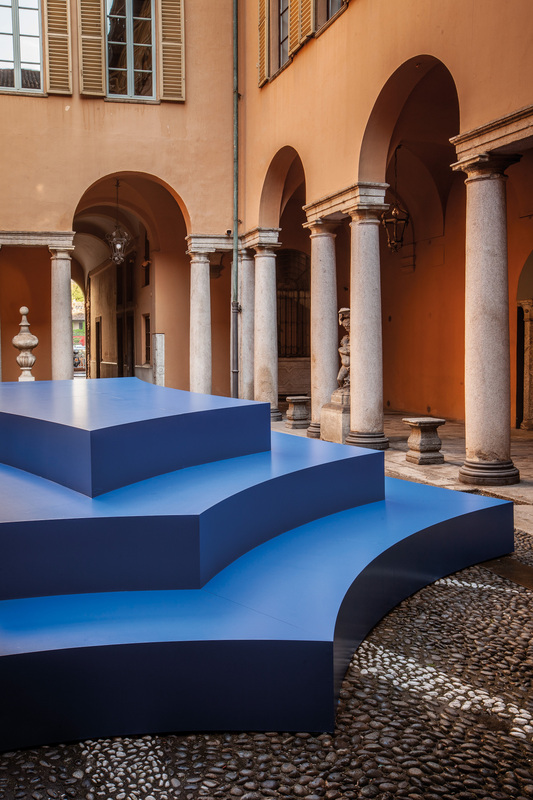 Salone del Mobile attendees have much to see across the fair’s endless expanse of halls, but Milan Design Week itself contains multitudes—these installations around town prove it. For one week in April, all eyes are on Milan as the city undergoes an overnight transformation into the world’s undisputed capital of all things design. 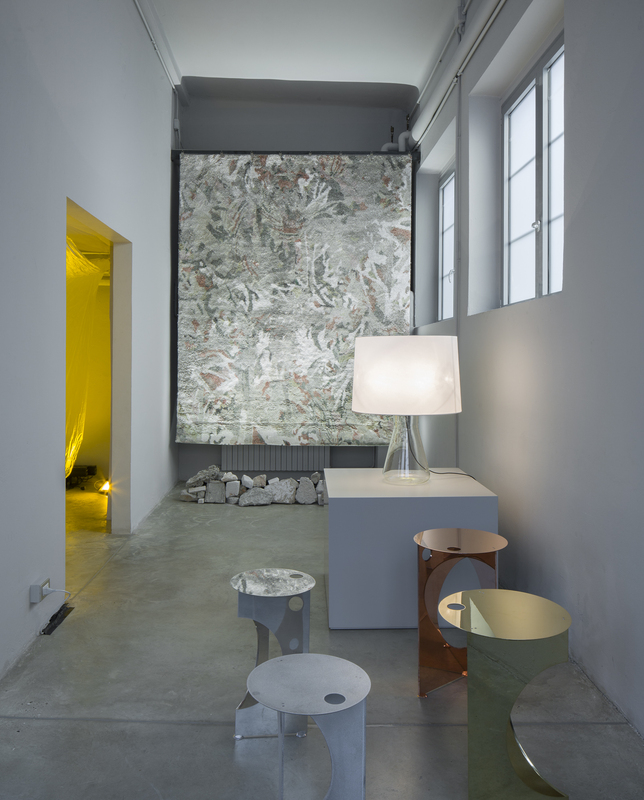 Salone del Mobile attendees have much to see across the fair’s endless expanse of halls, but Milan Design Week itself contains multitudes. 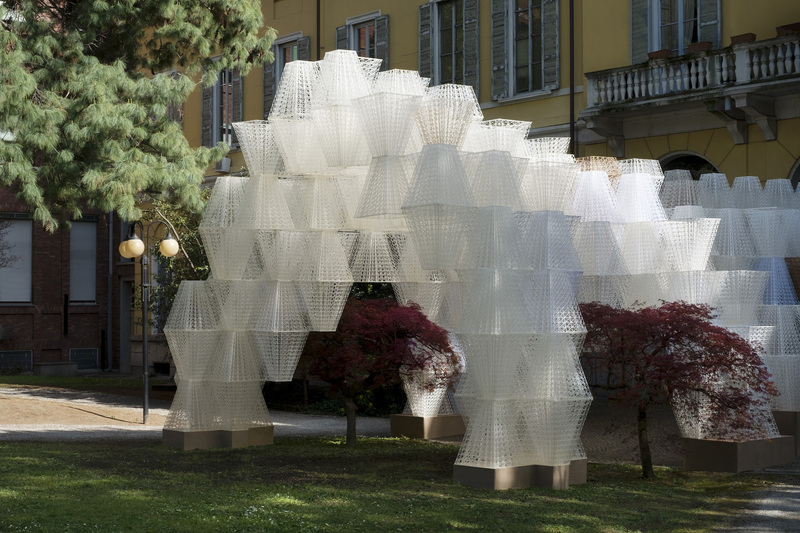 From 3D-printed bioplastic pavilions to an array of lighting fixtures inspired by acid-induced synesthetic visions, here are the installations around town you’d be remiss to miss. To celebrate Nita’s first permanent showroom, founder Nicolo Taliani teamed with Brooklyn-based textile studio Eskayel for an immersive exhibition curated by Natalie Marie Gehrels of Studio Ouruse. It explores humanity’s fraught relationship with the environment—take Eskayel’s new Omaggio collection, inspired by a Tuscan-style garden in San Diego cultivated by founder Shanan Campanaro’s Italian-American father. Campanaro, whose prowess at painting is well-documented, reveals works of tree- and terracotta-strewn terrain across tapestries, rugs, and large-scale wall murals that honor her father’s heritage. 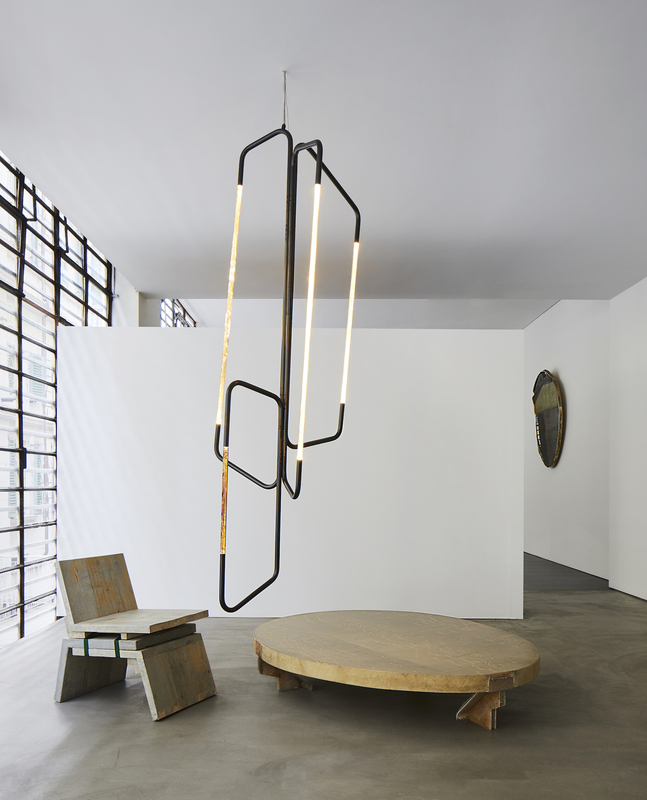 Such elements intermingle with Nita’s boundary-blurring lighting fixtures, which convey raw emotion through primary shapes and pure materials. Teaming up with Lost Profile Studio, Australian lighting designer Christopher Boots delves into the notion of archives as living history. Through a series of previously unseen lighting fixtures in using his signature crystalline palette, Trove begs the question: What do the materials, processes, and forms communicate about the artisans who have created these objects and their particular moment in history? How will future inhabitants decode these items? 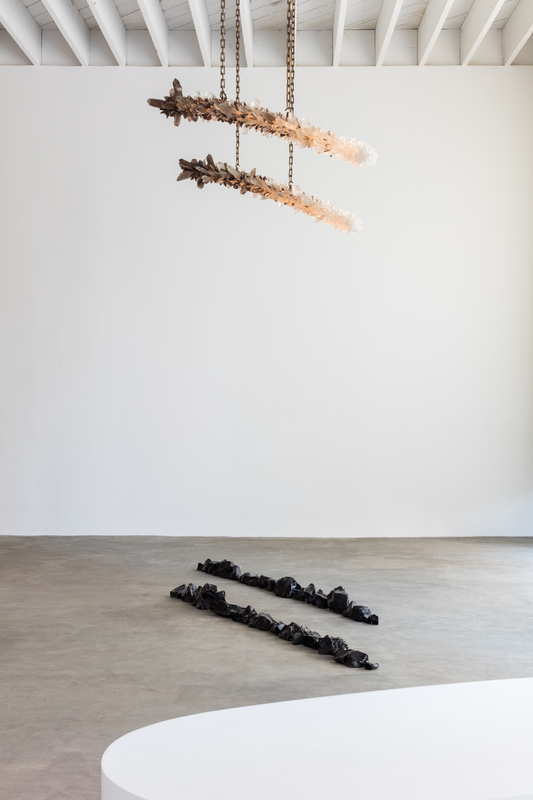 New York furniture and lighting studio Apparatus, founded by work-and-life partners Gabriel Hendifar and Jeremy Anderson, presents Interlude, an entirely new body of work that disrupts the acts of the studio’s established narrative progression and inaugurates Apparatus Editions. 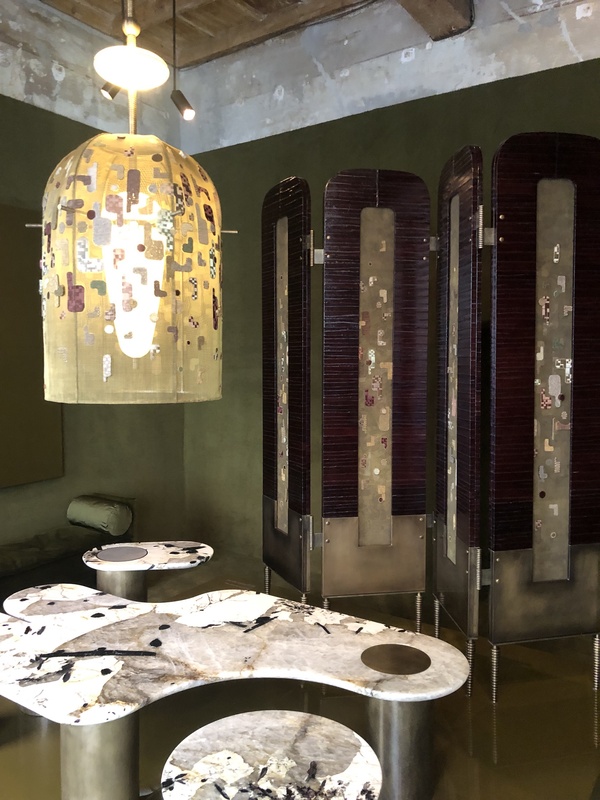 Musical references inform the collection, which runs the gamut from hand-embroidered lighting fixtures inspired by artist Stephen Malinowski’s acid-induced synaesthetic visions mingling with Patagonia marble tables that evoke rounded planes. A duo of cabinets, riffing on the compositional tradition of theme and variation, employ such off-the-beaten-path materials as eel skin while evoking the tactile experience of a suede instrument case. 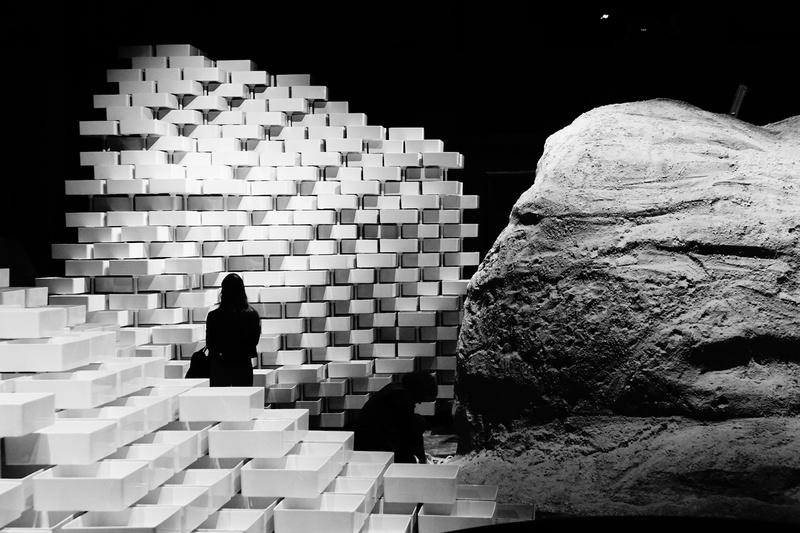 Visitors to the Teatro Arsenale encounter a swooping wall of all-white bricks installed by Snarkitecture, the New York architecture and design studio known for eminently Instagrammable installations and Snark Park, their permanent exhibition space in Hudson Yards. For Milan Design Week, however, the studio uses a material mix to narrate iconic Swiss bathroom brand Laufen’s 127-year history. 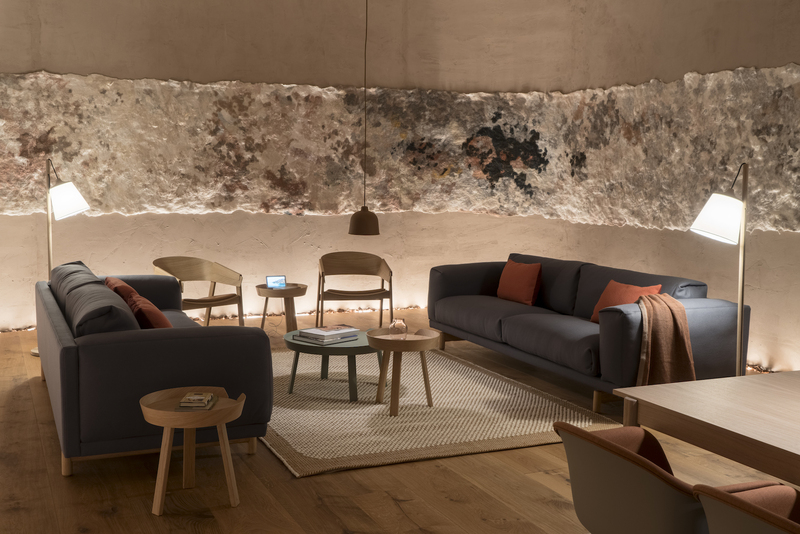 The installation employs materials from Laufen’s industrial ceramic production to chronicle the production process of SaphirKeramik, which sees a mountain of clay become a polished ceramic. 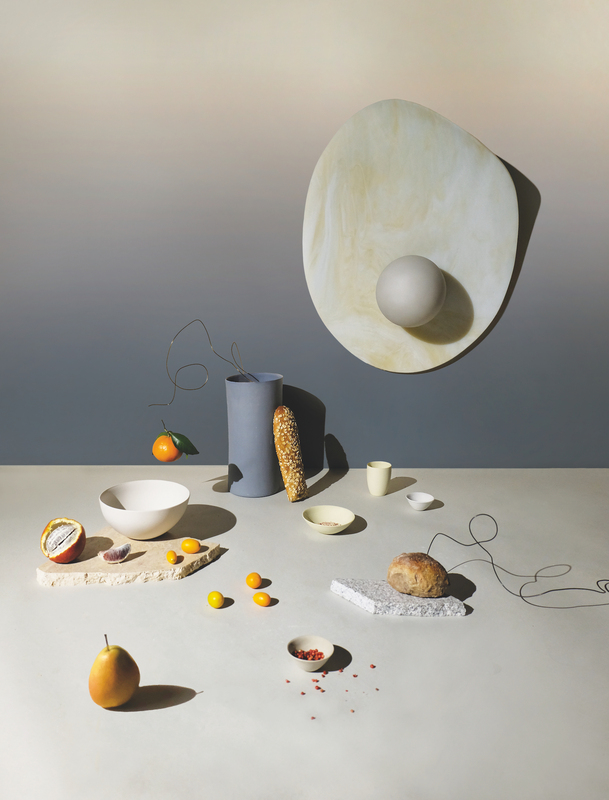 Those seeking temporary respite from the Milan Design Week bustle may find solace in Still / Life, a sensorial installation conceived by Ladies & Gentlemen Studio founders Dylan Davis and Jean Lee. Ceramics purveyor MUD Australia showcases a new series of matte porcelain objects in a subtle colorways to celebrate the brand’s 25th anniversary. A site-specific custom print of Calico Wallpaper’s dreamy Aurora pattern backdrops the arrangement, illuminated by Ladies & Gentlemen Studio’s new Myrna fixtures. In the next room, Calico Wallpaper debuts the Muse collection, which translates Faye Toogood’s original hand-painted artworks that create a painterly tableau of feminine expressions. Exploring the creative possibilities of its new iQ Surface collection of vinyls, Tarkett joins forces with Note Design Studio to question notions of scale by upending architectural archetypes. 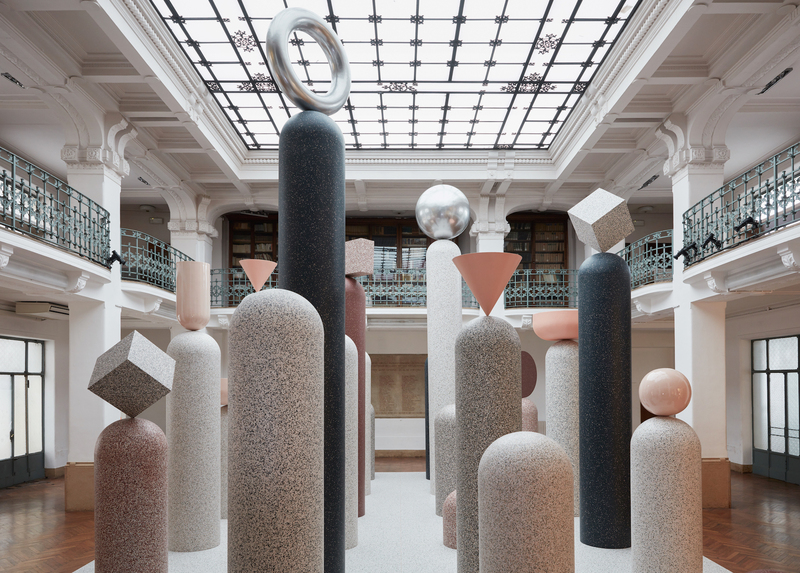 Scattered throughout the Circolo Filologico Milanese are 24 rounded-top columns—the largest towering at more than 16 feet—in which repeated geometric objects balance carefully atop. Magis furnishings, such as Konstantin Grcic’s cylindrical-backed Brut sofa, reflect iQ Surface’s color palette and echo the installation’s geometric forms. The venerable purveyor of ergonomic office furniture invited longtime collaborator Todd Bracher to design a multi-dimensional experience at Ventura Centrale. Bracher tapped digital design practice Studio TheGreenEyl to reinterpret the scientific method of motion perception developed by Swedish psychophysicist Gunnar Johansson in 1973, which involved placing lights on key points of the human body to highlight movement. 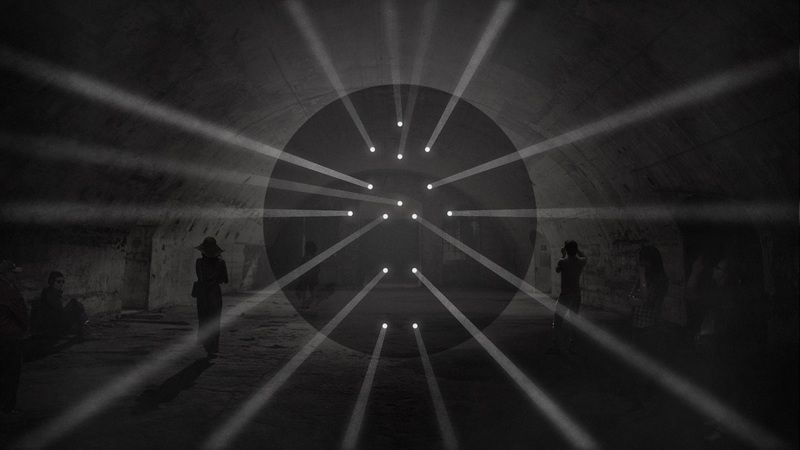 Using digital projection and sensors to collect and communicate data through 15 beams of light, the installation becomes a digital artwork that beckons visitors to perform their own movement, which then converts into rays of light visible throughout. Curated by Claudia Rose and Vincenzo De Cotiis, Anthology features original pieces by the latter placed in conversation with works by fifteen artists from Carpenters Workshop Gallery’s roster, including Atelier Van Lieshout, Nacho Carbonell, and Ingrid Donat. Each work represents the shared archetypal gesture of material manipulation, transforming the gallery into a sculptural archive that engages in a dialogue about our differences and consonances. An extension of Earth Stations, a previously unrealized architectural project by Michele de Lucchi, Connecting Experiences proposes a new place that will shape human relationships in the wake of technology’s overreaching grasp. De Lucchi will rethink Poltrona Frau’s Milan flagship according to his vision of new communication typologies. He maps out the flagship into several nodes, including a large co-working space, a conference room, an individual reading room, and a coffee bar, each furnished by Poltrona Frau to animate De Lucchi’s vision. Co-created by Google’s Ivy Ross, Muuto’s Christian Grosen, Reddymade Architecture’s Suchi Reddy, and Johns Hopkins University’s Susan Magsamen, multi-room installation “A Space for Being” demonstrates how different aesthetic experiences can potentially impact our biology and well-being. Guests receive a wristband that measures specific physical and physiological responses and visit three rooms that incorporate various design experiences. At the end, a customized report suggests which space each guest felt the most comfort based on neuroaesthetic principles. Installed in a 16th-century palazzo, the Swedish fashion brand’s eighth consecutive Milan Design Week installation features a digitally designed and sculptural pathway of wood and bioplastic composite lattices comprised of 700 interlocking modular bio-bricks by architect Arthur Mamou-Mani. Conifera’s construction suggests both legacy and ephemerality—its modular build allows the installation to be dismantled and reformed in alternate configurations in response to new contexts. Visitors can observe one of the Delta WASP (World Advance Saving Project) 3M% Industrial 3D printers used to fabricate each of the bio-bricks in action.